Congenital hypertrophy of retinal pigment epithelium (CHRPE) is a benign, pigmented, flat lesion arising from the retinal pigment epithelium (RPE). 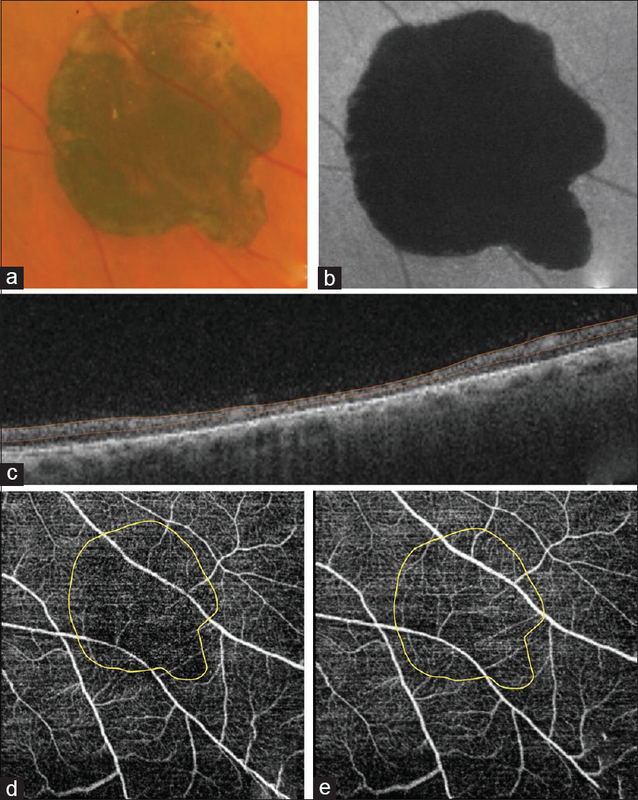 Various vascular changes over solitary CHRPE have been described using fundus fluorescein angiography (FFA)., In FFA, the visualization of the choroidal vasculature is obscured by hypertrophied RPE. 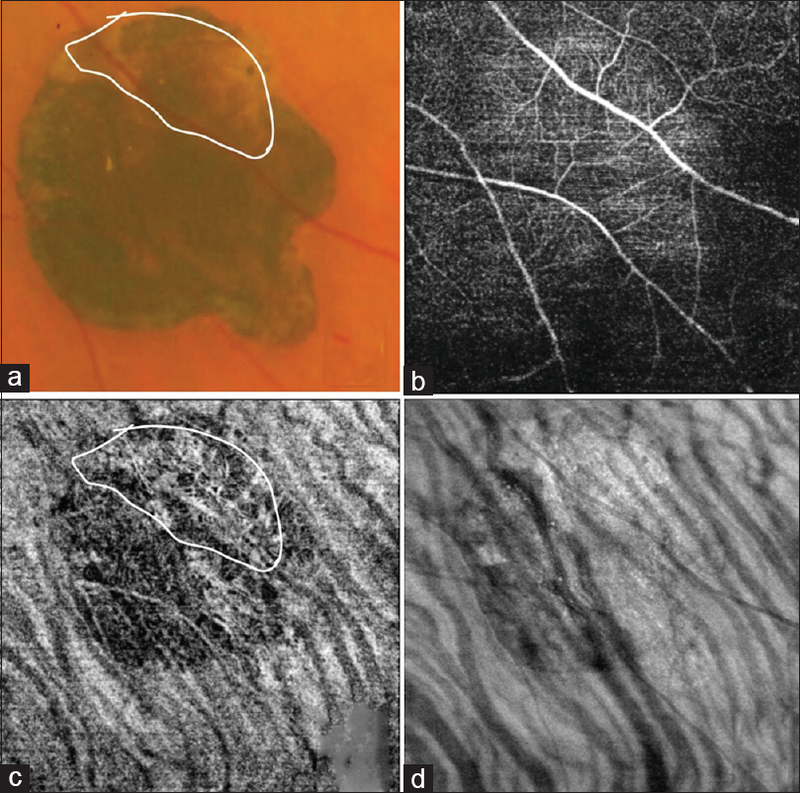 Optical coherence tomography angiography (OCTA) features of various retinal and choroidal tumors have been described., In this study, we report OCTA features of two cases of solitary CHRPE. A 40-year-old male presented to us for routine eye examination. On ocular examination, he had best-corrected visual acuity (BCVA) of 6/6, N6 in both eyes. Left eye anterior segment was normal. Fundus examination of the left eye revealed a well-demarcated, flat, brownish-black pigmented lesion in inferonasal quadrant measuring three disc diameters in size [Figure 1]a. The lesion was hypo-autofluorescent on fundus autofluorescence (FAF) [Figure 1]b. OCT over the lesion revealed thinning of the outer retinal layers [Figure 1]c. OCTA on automatic segmentation at the level of superficial capillary slab showed a signal void area corresponding to the lesion, giving an impression of hypoperfusion [Figure 1]d. But the vasculature was found to be normal on manual segmentation [Figure 1]e. Deep capillary slab revealed normal vasculature after manual segmentation [Figure 2]a and [Figure 2]b. Choroidal slab at the level of large choroidal vessels showed a patch of heterogeneous signals corresponding to the extent of the CHRPE. The flow signals of the lesion were high where the lesion was hypopigmented superiorly. The large choroidal vessels which were seen like a ribbon till the margin of the lesion could not be traced into the lesion on OCTA. Projection artifact due to overlying vessels could be seen in deeper choroidal slabs [Figure 2]c. The underlying choroidal vessels could be better appreciated on en face OCTA [Figure 2]d.
A 35-year-old male presented to us for diminution of vision in both eyes. On examination, BCVA was 6/6, N6 in both eyes. Right eye examination was unremarkable. Left eye fundus examination revealed a pigmented well-demarcated brown lesion in the inferotemporal quadrant with lacunae and surrounding halo [Figure 3]a. Lesion was hypoautofluorescent on FAF except at the lacunae where it was hyperautofluorescent [Figure 3]b. OCTA of the lesion showed blink and motion artifacts. On manual segmentation, superficial vasculature was normal. Interestingly in the superficial slab, branching of the major blood vessel was noted which was not seen clinically [Figure 3]c. Choroidal slab at the level of large choroidal vessels showed signal void corresponding to the lesion. A high reflectivity signal was noted at the lacunae [Figure 3]d.
CHRPE is a benign pigmented fundus lesion which has an indolent course. Few vascular changes associated with CHRPE are capillary nonperfusion, microanuerysms, and chorioretinal anastomosis., All these vascular changes were described using FFA. In both the cases in our study, the retinal vasculature over the lesion was normal. Due to thinning of the outer retina, automatic segmentation resulted in segmentation artifact. Similar thinning of outer retina was reported by Fung et al., who proposed that thinning might be due to loss of photoreceptors as a result of poor phagocytic activity of RPE. Hence, while analyzing the retinal vasculature over CHRPE, one should analyze the slabs after manual segmentation, as signal void areas on automated segmentation can be mistaken for hypoperfusion. In our cases on OCTA, the hyperpigmented RPE caused masking artifacts resulting in signal void and areas of relatively hypopigmented areas (lacunae) over the CHRPE resulted in high flow signal due to unmasking. Parsons et al. and Lloyd WC et al. in their microscopic observation of CHRPE noted that RPE cells are approximately twice as tall as normal cells, with intense, uniformly distributed round pigment granules. Lacunae are associated with RPE atrophy and loss., This report correlates OCTA findings with known histological facts about CHRPE. En face OCTA in case 1, when compared with OCTA, had better visualization of the large choroidal vessels underneath CHRPE. Parsons et al. reviewed histopathological features of both solitary and grouped CHRPE. Of the 10 studies reviewed, only 1 study by Shields and Tsohas commented on the choroidal vasculature. Shields and Tso reported that choroid was normal on gross examination of an enucleated eye with grouped CHRPE. Fung et al. in their study on enhanced depth imaging of CHRPE reported that the underlying choroid was identical in thickness and vascular appearance when compared with the tissue immediately outside the CHRPE margin. Based on the normal choroidal findings underlying CHRPE, it has been suspected that CHRPE is unrelated to the choroid. The granules in the RPE block the visualization of underlying choroidal vessels on FFA and indocyanine green angiography (ICGA). Unlike FFA and ICGA, the choroidal vasculature could be better appreciated on OCTA except for minimal masking owing to thickened RPE. 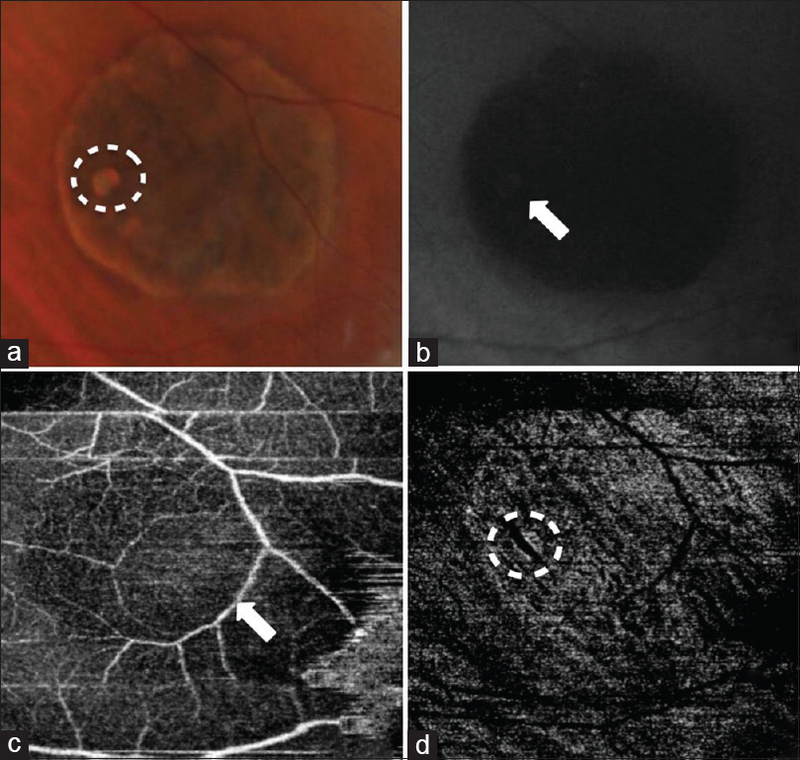 In case 2, the superficial blood vessel overlying CHRPE which was seen on OCTA was not seen on color photograph [Figure 3]c. This might be because of the obscuration of the vessel by overlying pigment clumps as described by Touriño et al. in their study on FFA features of CHRPE. Such pigments should also cause masking of signal on OCTA, but the reason for absence of masking in our case cannot be explained. The limitation of OCTA is that it is difficult to image peripheral lesions and hypertrophic RPE obscures the visualization of the choroidal vessels partially. The majority of CHRPE lesions are located anterior to the equator and hence difficult to image by OCTA. With conventional fundus camera, Touriño et al. reported that only 27.8% of the lesions could be studied using FFA. With the advent of wide-angle OCTA, this shortcoming can be overcome. The hypertrophic RPE prevents deeper penetration of the signal into deeper choroidal structures to some extent. To conclude, OCTA is a useful noninvasive tool in assessing vascularity of CHRPE. Using OCTA, we could image the choroidal vasculature which was not possible with FFA and ICGA. The OCTA findings correlated well with the histological features of CHRPE. Superficial large vascular branches over CHRPE which could not be identified on clinical examination could be detected on OCTA. OCTA is an excellent noninvasive tool in evaluating the retinal and choroidal vasculature of CHRPE. Gass JD. Focal congenital anomalies of the retinal pigment epithelium. Eye 1989;3:1-18. Touriño R, Rodríguez-Ares MT, López-Valladares MJ, Gómez-Ulla F, Gómez-Torreiro M, Capeans C. Fluorescein angiographic features of the congenital hypertrophy of the retinal pigment epithelium in the familial adenomatous polyposis. Int Ophthalmol 2005;26:59-65. Cohen SY, Quentel G, Guiberteau B, Coscas GJ. Retinal vascular changes in congenital hypertrophy of the retinal pigment epithelium. Ophthalmology 1993;100:471-4. Toledo JJ, Asencio M, García JR, Morales LA, Tomkinson C, Cajigal C. OCT angiography: Imaging of choroidal and retinal tumors. Ophthalmol Retina 2017;2:613-22. Konana VK, Shanmugam PM, Ramanjulu R, Mishra KD, Sagar P. Optical coherence tomography angiography features of choroidal hemangioma. Indian J Ophthalmol 2018;66:581-3. Fung AT, Pellegrini M, Shields CL. Congenital hypertrophy of the retinal pigment epithelium: Enhanced-depth imaging optical coherence tomography in 18 cases. Ophthalmology 2014;121:251-6. Parsons MA, Rennie IG, Rundle PA, Dhingra S, Mudhar H, Singh AD. Congenital hypertrophy of retinal pigment epithelium: A clinico-pathological case report. Br J Ophthalmol 2005;89:920-1. Lloyd WC III, Eagle RC Jr, Shields JA, Kwa DM, Arbizo VV. Congenital hypertrophy of the retinal pigment epithelium. Electron microscopic and morphometric observations. Ophthalmology 1990;97:1052-60. Shields JA, Tso MO. Congenital grouped pigmentation of the retina. Histopathologic description and report of a case. Arch Ophthalmol 1975;93:1153-5. Chamot L, Zografos L, Klainguti G. Fundus changes associated with congenital hypertrophy of the retinal pigment epithelium. Am J Ophthalmol 1993;115:154-61.